Nurses work in a caring profession, helping patients heal from their illnesses and injuries and working toward positive changes in healthcare. In doing their jobs, however, nurses may also face workplace violence. Healthcare and social service workers, including nurses, face the risk of being injured as a result of job-related violence, the safety-focused Occupational Safety and Health Administration (OSHA) said. While federal regulators and accrediting agencies have been cracking down on medical facilities that fail to protect employees from violence, many say more work needs to be done. Many states do not have laws that specifically protect healthcare workers. Nurse organizations are among the many groups hoping to change state and federal laws to protect workers. The groups want medical facilities to take a proactive role in protecting employees. “Abuse is not part of anyone’s job and has no place in healthcare settings. Time’s up for employers who don’t take swift and meaningful action to make the workplace safe for nurses,” American Nurses Association (ANA) President Pam Cipriano said in American Nurse Today. Registered nurses (RNs) are among the many healthcare workers who are lobbying for policy changes that may help reduce job-related violence. RNs who undertake RN to BSN programs learn the skills needed to become leaders. At Duquesne University, the RN to BSN online program provides opportunities for all nurses to take steps to stop workplace violence. Acts of aggression take many forms, including bullying, spitting, punching, incivility, intimidation and yelling. The ANA said incivility and bullying are serious issues in nursing and can include rude, disrespectful, discourteous actions. The ANA further defines bullying as actions and comments meant to humiliate, offend and cause distress. Criminal intent – A perpetrator with no relationship with the victim commits an act of violence. An example includes a nurse being assaulted in a hospital parking lot. This kind of incident is rare in a healthcare setting. Customer/client – A perpetrator who is a member of the public assaults the on-duty nurse. An example includes a nurse being assaulted in a waiting room or a psychiatric ward. This is most common in a healthcare setting. Worker on worker – Commonly called bullying or lateral/horizontal violence, this type of aggression usually includes a perpetrator in a supervisory role. This can include verbal and emotional abuse. Personal relationship – The perpetrator has a relationship with the victim and violence spills over to the workplace. This can include instances of domestic violence. Nationwide, workplace violence costs an estimated $4.3 billion annually and fuels staff turnover, recruitment and retention expenses and workers’ compensation claims, the New York State Nurses Association said. The heightened stress in the workplace leads to increased absences and more stress on those left to do the work, further eroding staff morale. 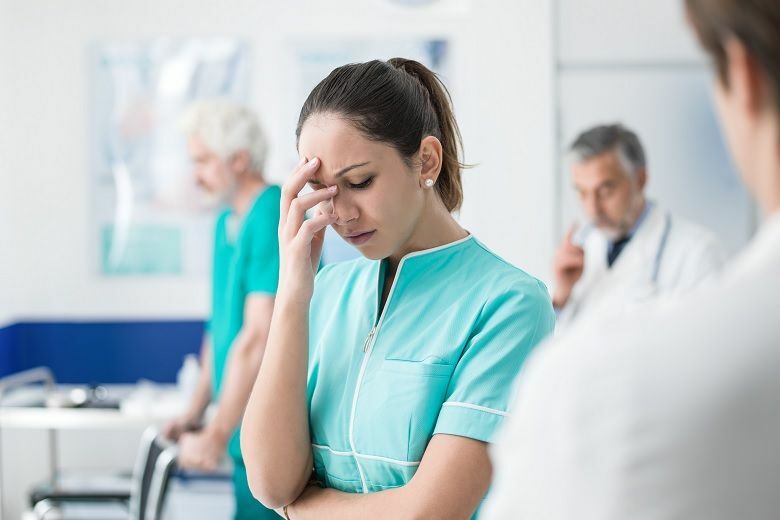 “This environment erodes what trust exists between management and nurses, which may lead to higher incidences of patient complaints and greater risks of stress in patients,” the association said. At the same time, however, violence against healthcare workers is underreported. About 30 percent of nurses do not report violence because they believe acts of violence are part of the job, they fear repercussions or they believe assailants are not responsible for the violence because of their mental states. With the growing focus on workplace violence in healthcare, organizations have taken notice and are taking action. In June 2018, The Joint Commission released an alert outlining seven steps healthcare organizations should take to address workplace violence. The commission, which accredits more than 21,000 healthcare organizations in the United States, released its Sentinel Event Alert to help healthcare organizations recognize and address workplace violence, better prepare staff to handle violence and protect nurses from workplace violence. The commission said all acts of violence, whether physical, emotional or verbal, warrant notification to leadership and, if needed, law enforcement. Define workplace violence and put systems in place that allow employees to report incidents of violence, including verbal abuse. Track all workplace violence incidents, including verbal abuse and attempted assaults. Support victims, witnesses and others impacted by the violence by providing psychological counseling and trauma care. Determine the factors and worksite conditions that may have contributed to the violence. Develop plans to reduce workplace violence, including physical changes to the workplace and to work and administrative practices. Train staff in de-escalation and self-defense. Continually analyze and review violence-reduction initiatives. The commission said healthcare workplaces (including hospitals, nursing care centers, office-based surgery centers and home healthcare) are required to provide safety and security measures for their employees. Workplaces that do not have the measures in place to prevent and respond to acts of violence could jeopardize their accreditation and may receive a citation from OSHA. Many nursing organizations think the threat of a citation or accreditation loss is not enough. Organizations that include the Silent No More Foundation have proposed that all states enact laws that make violence against healthcare workers a felony. Other lobby groups have encouraged employers to take a tougher stance in protecting nurses from workplace violence. Through the efforts of the California Nurses Association/National Nurses United (CNA/NNU), all acute-care hospitals and skilled nursing facilities in California must develop and implement workplace violence prevention plans. The medical facilities face fines if they do not enact the protections. At the same time, federal lawmakers are reviewing a bill that would require all healthcare employers to adopt comprehensive workplace violence prevention plans. The Health Care Workplace Violence Prevention Act has been in review with the House Subcommittee on Health since March 2018. On a local level, nurses themselves can take action in their workplaces to encourage employers to enact protections. RNs who are seeking a Bachelor of Science in Nursing (BSN) degree have the opportunity to grow as nurse leaders who can lead changes for safer workplaces. Through Duquesne University’s RN to BSN online program, RNs take foundational leadership and ethics coursework that can help them become catalysts for positive change. The Duquesne University online RN-BSN courses are flexible, so RNs can continue their education and advance their careers with little disruption to their work and personal schedules. The program offers three start dates per year and accepts transferred credits. The RN-BSN online program also provides one-on-one faculty mentorships and ample opportunities to collaborate with other BSN students from around the country. For more information, visit DU’s online RN-BSN program website.